The Raucous Royals: Amazing Grace - Could you survive a voyage on a Slave Ship? 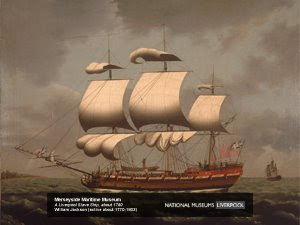 Amazing Grace - Could you survive a voyage on a Slave Ship? I am not sure if it is the pregnancy hormones shrinking and expanding my brain, but I recently had a strange memory of my childhood. I was about 8 or 9 and walked in on my mother and father having a disagreement on whether I should be allowed to stay up late to watch the miniseries Roots. My dad wanted us to watch it. He had grown up in a rural area of Mississippi and actually witnessed a lynching. He was afraid that Black American History would be a subject skimmed over in my classroom. (he was probably correct). My mother had grown up in an affluent all-white area and thought the series was too graphic for an eight year old. (She was probably correct too) My dad eventually won and my siblings and I cuddled close together night after night to watch Roots on our dial controlled/antenna TV. Well, I had not seen Roots since I was a child, so I recently decided to watch it again. Right about the time that the slave traders cut off Kunta Kinta’s foot, I remembered why I had not watched it in all of these years. The miniseries is really gut-wrenchingly sad. And the scenes on the slave ships would make even a nonhormonal person weepy. Since some of my favorite royals invested in the slave trade including Elizabeth I, Charles II, and James II, I wanted to know if conditions were really as bad as the Hollywood version. I found they were a lot worse. If you were to step onto a slave ship in the 18th century, you would first be hit with the unforgettable smell of sea salt, human excrement, sweat, tears, and most horrific of all…. death. Death on a slave ship was inescapable. The mortality rate was as high as 25% on some slave voyages with many dying of disease and dysentery. Others jumped overboard or hung themselves with their cotton shirts preferring suicide to their confinement. Many starved themselves to death. If a slave did survive the voyage, they could barely walk once they reached their destination (usually the Americas). 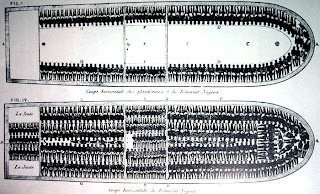 The design of a typical slave ship looks too grotesque to be real. Slaves slept packed in rows and were emerged in complete darkness. In 1788, an act passed in Britain decreed that each male slave had six feet, sixteen inches of square feet. Each female had five feet sixteen inches. Boys had five feet, fourteen inches and girls had four and a half feet by twelve inches. Worst of all, slaves had only two feet of breathing space above them to block out their neighbor’s screams. We can imagine that if you got seasick then it would be on yourself and your neighbor. Not that we should have much sympathy, but the crew didn’t exactly have cruise ship living conditions either. They were often given the same food as the slaves, worked excruciating long hours and were physically abused by their captains. Captain Colley of Liverpool even beat his cook to death with an iron rod. I guess he wasn’t happy with his meal. The food consisted of a barely palpable ration of rice, farina, yams and bran with very little water. If you are of African American descent then there is a good chance that you struggle with high blood pressure. You inherited high blood pressure from your ancestors because the only slaves that survived were those who had an ability to retain salt. The only relief from this confinement was when the slaves were brought on board to be examined by the doctor or get some exercise. Men, women and children were shackled to a long chain attached to a ring on the deck. Often, they were forced to sing and dance to exercise their limbs. Hypocritically, captains also forced slaves to recite Grace before meals in a religion that meant nothing to them. One of these captains was Reverend John Newton who ordered that Grace be said twice a day on his slave ship. He was later to become an abolitionist and is best remembered for writing the popular hymn, Amazing Grace. Here is a beautiful rendition of Amazing Grace sung by Leann Rimes. Slavery Remembrance day will be celebrated this year on August 23rd to commemorate the uprising of enslaved Africans on the island of Saint Domingue (modern Haiti) in 1791. Visit the International Slavery Museum to lean more. Sources and Further Reading:Kleinman, Joseph & Kurtis-Kleinman, Eileen. Life on an African Slave Ship, San Diego, CA: Lucent Books, 2001. Interestingly enough though, I took a class in Black History at a college a few years ago; it was taught by a black professor. He stated in class that the conditions on ships varied drastically as the slave trade went on. Initially the condiations were heinous, but as the trade grew and traders realized that "tight packing" of slaves wasn't profitable it decreased dramatically. Later on mostly young men and women were taken, and they were modesty well treated and fed; and most survived. I remember watching "Roots" when I was very young (not the original airing--I was 1 in 1977). Mom insisted that I sit down and watch it with her. I remember only making it through the first episode. It upset me so much that Dad laid down the law: No more "Roots" until I was old enough to "handle it." Although I know I should, I still--to this day--haven't watched it. The Gentleman - that is really interesting. I am certainly by no means an expert on the subject, but I do remember reading that conditions did improve later. Still, the cynic in me can't help but feel conditions only improved to protect the slave traders investment. Loosing 25% of your "cargo" is just bad business. National Museums Liverpool - I will do a separate post to remind people to vote. Love the site....tons of great info. Amy - 1977? I couldn't have been old enough to see the first viewing either then? (I would have been 5) So I wonder if it was the second viewing that I saw? Do you remember when it viewed? I must have been older than 8. You young whippersnappers. I saw the original airing and it was heartwrenching. You're kidding. That's who wrote Amazing Grace? Yikes. Of course it was to increase their profit. Humanity? I don't think they understood it the same way. Probably those that did, didn't survive either. Interesting about the health heredity. Interesting and sad. I have no idea if I saw the program on regular TV (like PBS) or on video (Mom was a serial renter). It was probably PBS, to be honest. 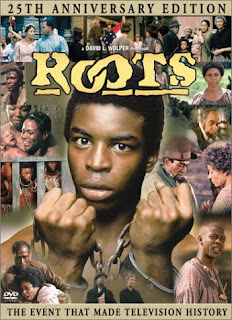 I doubt our rinky dink video store (stocked with Ernest movies) would have had anything as profound of "Roots." Thanks for the post, I was I think 14-15 when it came on T! a couple years ago, i couldn't stand it! I was so upset. In school they merely mention slavery a couple of underground railroad workers and moved on. What a disservice to my ancestors (Dad cam from fields of Jamaica, Mom, Jim Crow Mississippi and migrated to the north for more opportunities). Thanks again, LOVE YOUR BLOG! I'VE LEARN SO MUCH AND IT'S SO MUCH FUN!